This is another sneak preview post in our series of what's new in the upcoming 5.0 release. Today, I will introduce 6 new social views in PIEmatrix and why they are important to business performance. Important --- These social features will be a major addition to PIEmatrix and we hope to get great feedback from our customers as they start to use it. We don't assume we will have a perfect solution, and we will make it better over time with customer feedback. A market problem with social applications like Yammer and Chatter is that a lot of the chat is not focused on goals, objectives, and tasks at hand. Rather, many of these tools are more about conversations. The following diagram is provided by David Coleman, Managing Director and Senior Analyst at Collaborative Strategies, a research and consulting firm specializing in collaboration. 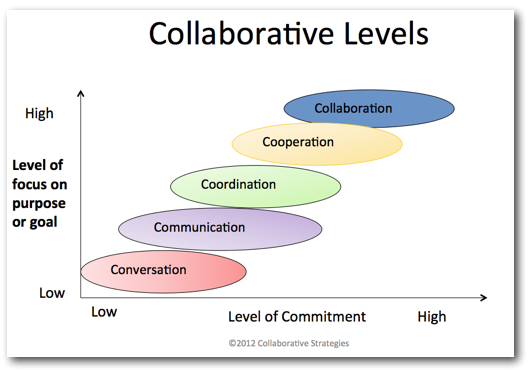 This diagram shows that the higher the level of focus and commitment, the more it becomes real collaboration. In our current and previous versions, customers have been able to add an issue or risk comment to a step. This has been very powerful for managing issues and risks with team members. What if we need to communicate about something that is not related to an issue or risk? Traditionally, we would need to send an email. The problem with email is the conversation gets bundled with lots of other important stuff and some junk. What if we could have a conversation at the step level with people who care and can contribute? What if that feed stays put --- right in its proper place? That solution is our Laser #1 feature in the upcoming release, version 5.0. A PIEmatrix customer member will see all news activity revolving around their action step. News items would include information like who did what and when. A PIEmatrix process box is a milestone or a process container of a set of steps under a project's phase (slice). By selecting the box, we will be able to see its own news feed. This is important when a number of people are working to get it done. This social view will display what's going on and all conversations in one place. Roll up the view to the slice of the project's process layer and now we can see all conversations and news about what's going on at the level. If our project has only one layer, then the layer-level feed would be the same feed view for the entire project. But if the project has multiple layers, the team responsible for that layer process stream may be interested in knowing what is going on only for that process stream. Rolling the view up to a layer level will give a summation of all the news and conversations for that focus area. Roll up to the project level and see all the posted comments, conversations and news across the project. Switch over to the new Social workspace tab and get the entire news feed across all assigned projects. At this level, we will be able to post comments for everyone to see. What if you are working in another workspace, such as the To-do or Dashboard and someone adds a new post? How will you know? We added a subtle pulsating animation feature to the Social tab icon to indicate a new posting is ready for your view. Soon, I plan to provide more information about how to add a post to groups or individuals, how it integrates with issues and risks, and how the automatic news posting works.